금동미륵보살반가사유상(金銅彌勒菩薩半跏思惟像)은 왼다리를 내리고 걸터 앉아서 오른손을 들어 두 손가락을 살짝 뺨에 대고 생각하는 듯한 자세를 취하고 있는 미륵보살상이다. 긴 얼굴은 눈꼬리가 치켜 올라가고 미소가 없는 정적인 표정이다. 머리는 평평하게 표현되었고 그 위에 높은 상투 모양의 머리묶음이 있다. 가늘고 긴 몸은 양 어깨와 양 팔에만 옷을 살짝 걸치고 있으며, 옷주름은 단순하면서 매우 도식적으로 표현되었다. 목 둘레의 2중으로 된 구슬 장식은 무거워 보이는데 가슴 앞으로 내려와 X자형으로 교차되고 있다. 대좌(臺座)는 4각형의 대좌 위에 8각으로 된 받침을 놓고 그 위에 다시 연꽃이 새겨진 대좌가 놓여있는 모습인데, 보살상보다 크게 만들어져 전체적으로 안정된 느낌을 주고 있다. 4각형의 대좌에는 마름모꼴 문양이 1면에 2개씩 뚫려 있는데 대좌의 이런 모양은 우리나라 금동불에서는 보기 드문 예이다. 조각수법이 선과 면의 구분이 분명하고 잘 다듬어져 세련된 모습이며, 출토지가 분명하지 않지만 2중의 구슬장식과 가운데가 솟아오른 연꽃의 형식 등으로 보아서 삼국시대 후기에 만들어진 작품으로 추정된다. This Maitreya Bodhisattva statue is sitting with the left leg hanging down. 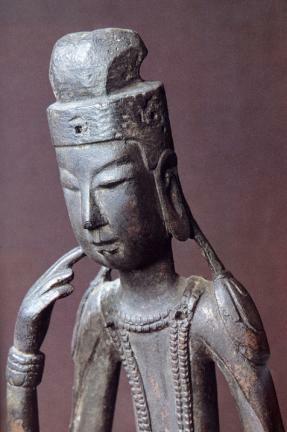 It is in a unique position because it looks as if it is thinking, holding up the right hand with two fingers spread apart and slightly touching the cheek. The eyes are slanting upwards on the long, unsmiling face, which is still and serious. The hair is flat and done in a topknot. The hair at the back is parted to each side and comes down to below the ears. The long, narrow body is wearing clothing only on the shoulders and arms. The double-tiered bead decoration around the neck looks heavy, hanging down the chest in an ‘X’ shape. The folds in the clothing are simple, almost like a graph. There is an upside down lotus flower design pedestal on the octagonal base, laid on top of the square pedestal. 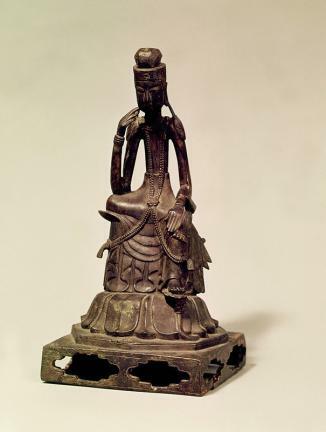 The square pedestal has two lozenge-shaped holes on each side, which is rare in the gilt-bronze statues of Korea. The carving is refined and polished with a clear distinction between lines and surfaces. The place it was excavated is not certain, but judging from the double bead decoration and the lotus flower style with a protruding middle part, this is presumed to have been made in the late Three Kingdoms.